Weather like we have been having all winter was bound to have some disadvantage show up… I guess it is early pollen. Hard on folks with contacts and neat freaks. The good news is that it is nowhere near as bad as it gets in Raleigh or Boulder Colorado, or a lot of other places I have been… but it is still here and I left my HEPA filter back in Raleigh when we left. It’s not a bad thing but it is a little annoying to keep finding grit in your eyes. Today was another beautiful day, a few degrees cooler than it has been but mid-60’s is not something to grouse about. We ate at the Sonic Drive-in and then drove on to the beach and just sat watching kite surfers, waves and birds. A nice park ranger came by and told us we could not park out on the harder damp sand but had to be back “behind the cones". If I had wanted to be back there in the loose and drifting sand (did I mention it was a bit windy today) I would have parked back there. 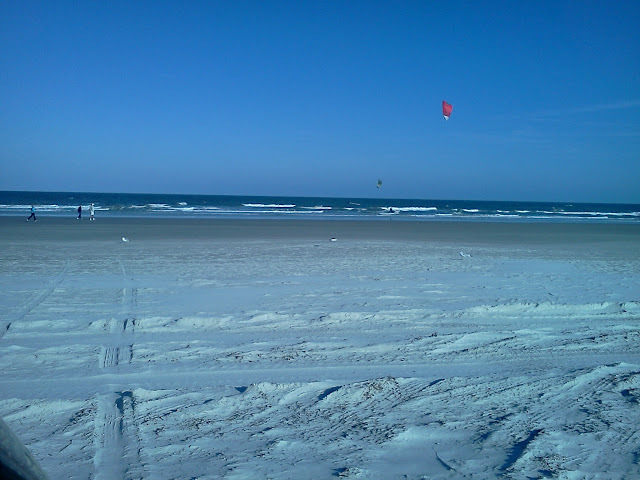 There was no one on the beach other than the 3 Kite surfers, a couple of cars and someone riding a bike out on the hard sand. I am not really afraid of getting the SMART stuck back there but I really did not like the stuff getting up into the bottom because of the low ground clearance. Still, we moved back behind the line and sat there for a very long time just absorbing the beauty of the day and our own company. It is impossible to not be thankful for every moment we have together, whether we have to park behind the cones or not.